These unique fish have an upright position, a horse-like head, and a prehensile tail. The Kuda seahorse coloration varies from grey, black, brown, yellow, orange, and red. They range in size from 6” to 11”. 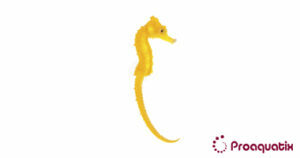 The Kuda Seahorse is found throughout South East Asia, Australia, and a few Pacific islands. Hippocampus kuda do best when kept as a mated pair, or with a small group of its own kind in a species-specific aquarium. They may also be kept with small, passive fish such as, pipefish, dragonets, small gobies, and dartfish. Proaquatix specimens have been weaned to eat frozen Mysis Shrimp and should be fed 2 to 3 times per day.